The products and services in the Travel Games Australia Internet site are supplied to the Developers by the suppliers of those goods and services. Changes may have been made after the date supplied so users should check the accuracy of the information with the suppliers before making any purchases. 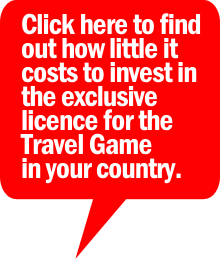 Travel Games Australia does not accept any responsibility or liability for any claims arising out of the descriptions or information supplied to it. Facts and figures are liable to change. All prices quoted are in Australian dollars unless otherwise indicated. Use prices as a guide only. Companies and/or agencies upon and by lodging material with Travel Games Australia for distribution or authorising or approving of the distribution of any tourism information material INDEMNIFY Travel Games Australia, its directors, employees and agents against all claims, demands, proceedings, costs, expenses, damages, awards, judgements and any other liability whatsoever, wholly or partially arising directly or indirectly in connection with copyright, infringement of trade marks or names of publication titles, unfair competition, breach of trade practices or fair trading legislation, violation of right of privacy or confidential information or licences or royalty rights or other intellectual property rights, and WARRANT that the information provided complies with all relevant laws and regulations and that its display will not give rise to any claims against or liabilities in Travel Games Australia, its directors, employees or agents and without limiting the generality of the foregoing, that nothing therein is in breach of any laws or regulations. The Travel Games Australia logo and board design are trademarks of Travel Games Australia. All rights reserved. All other trademarks appearing on the Travel Games Australia Internet site are the property of their respective owners. Copyright, Travel Games Australia. Travel Games Australia Pty Ltd is the Copyright owner of all text, images, designs, game play strategies, rules, questions, answers, formats and configurations on this website, excluding those that have been thankfully supplied by our sponsors and supporters. No part of this website or it’s content may be commercially duplicated in any format whether electronic, static or any other method, without prior consent of the owners. Travel Games Australia Pty Ltd wishes to indemnify the Company and all other parties associated in any way with this website, against all claims, damages, loss or injury, in relation to the content herein. Travel Games Australia Pty Ltd will prosecute any persons, companies or organisations found to be in breach and/or infringement of the protection of Copyright laws.